Tucker Zimmerman has gotten little sleep during the raging deadly fire in Shasta County, California. 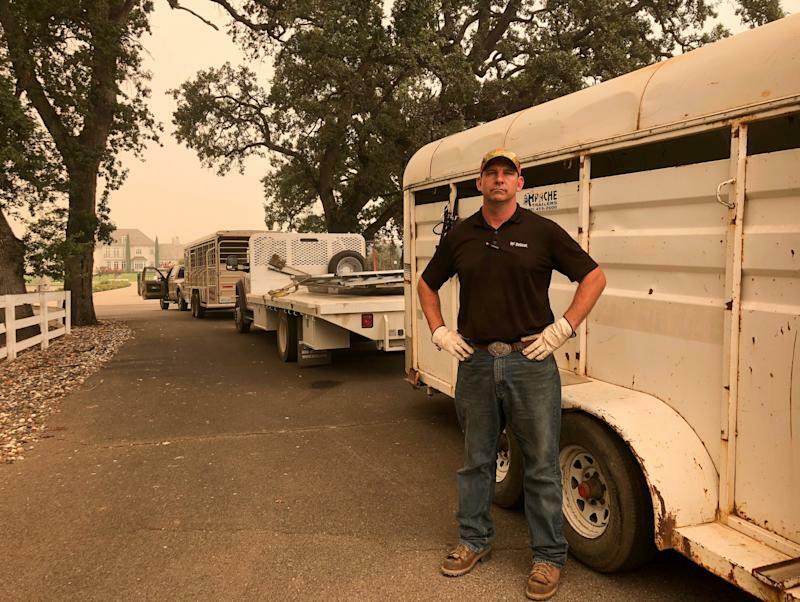 The retired U.S. Marine has rushed into a new battle, as a volunteer rescuing stranded horses and other livestock. So many thanks to this caring hero. That man is a hero, animals are the forgotten part of these horrible fires, there are those who make an effort to save them but so many perish is such a horrific way. There are fires so often in Calif, I just wish people would not have animals they cannot move. Thank You to that ex Marine, always a Marine, you are blessed. Rita, often it’s not that they cannot move them, but people away at work etc. are not allowed to return to areas closed off by firefighters in many many cases as they don’t want to have to rescue panicked people down every driveway. Also this time of year many people are away on vacations and horses especially are roaming in pastures, being checked on by others. The fires of today are much larger and more extreme in their behaviors to the extent it is almost impossible to plan for them. Consider that this fire doubled in size overnight while expanding in three directions, or take a look at the fire forensics from the Ft. McMurray “monster” in Alberta a few summers ago. The bottom line is if you live anywhere around anything combustible you face some risk. The Waldo Fire in Colorado, for instance, quickly took out whole subdivisions as the fire used wooden yard fences to eat its way from house to house. I once belonged to an animal evacuation team that was formed and trained by the fire department to be allowed to go in and remove people’s animals. Rather than judge people who have animals and allow them a good rural life, I suggest every place that is fire prone and has large animals consider forming such a localized nonprofit. Really good idea! Anybody that cares for their animals usually makes arrangements should something happen to them (people). This is just more of the same. No one wants to believe that its going to be necessary – but watching the fires, hurricanes and tornadoes increase day by day – it gets harder to close your eyes to that eventuality. Sort of like a community Night watch – only about animals. At this point in time – more than ever – people and their local community have to stick together. God bless this man. He is like an angel on a mission, so brave! Every now and then, there is an exemplary human being out there.
. He deserves a metal for all his hard work.rescuing horses. He’s a hero! He sure does restore ones faith in Humanity as the article says . God Bless this man !